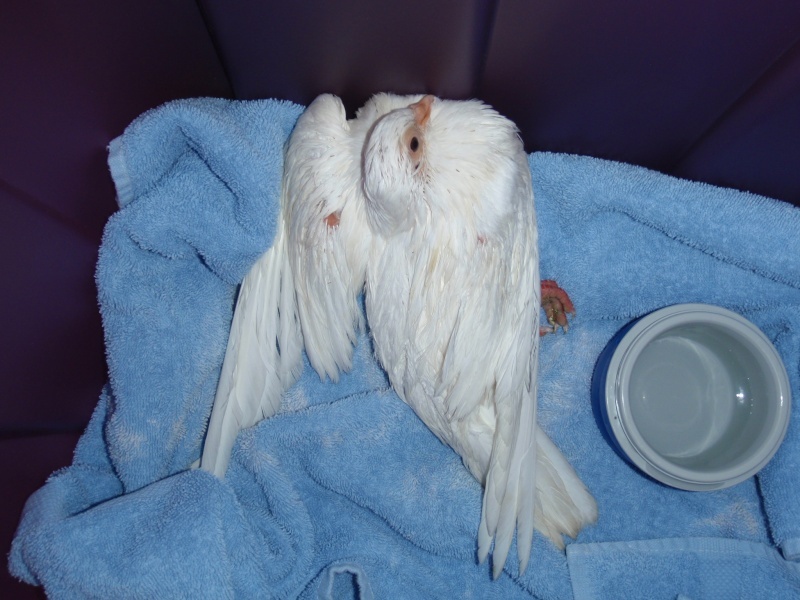 Over the weekend my father and I found a white injured pigeon on our way home from the gas station and couldnt leave it die, so we scooped it up and brought it home. The next Monday, I brought it into where I work (Veterinary Hospital) and one of the doctors splinted is broken leg and put it on a pain medication. Unfortuatly I do not have the resources nor the materials to keep the bird who has rediscovered his gift of flight. He is NOT a feral bird! Therefore I need to find someone willing to take the bird in and give it a permanent home. If you know anyone in the Cape Coral area who is willing to take him in, I would love to hear from you. I forgot to ask you if the bird has a band on his leg? Do you think the bird is for sure a male? I do have some ideas of placement which I will work on this weekend. The bird is unbanded and as far as gender goes, I have no idea. Trust me, I would have loved it if he had a band on his leg. It would have make this all easier and someone would have gotten their bird back. Thank you soooo much for all our help. You have no idea how much I appreciate it. Not sure if they are up or not on the last reply. Ive never used this type of uploader. Looks like a young bird to me. Will you have the doctors check for canker and worms? Many thanks to you and your Dad for taking this poor little guy and getting him medical help. He's beautiful and does look like a young bird. Please keep us posted on how things go with finding him a wonderful forever home. hello where are you located as i would be interested in offering him/ her a home i currently have 2 pigeons a male i rescued from the streets as a baby and hand reared he loves humans but not other pigeons and i have a beautiful white and brown girl who was paired with my rescued wood pigeon that sadly got very ill last night i passed away in my arms this morning : ( and now my females seems very sad and lonely even though she is next to my male but they cant go together and he beats her up. So if you are still looking for a home for him/her then i would be very interested if you are near by i live in london. First...welcome to Pigeon Angels, Cammypigeon. We are happy you have found us. 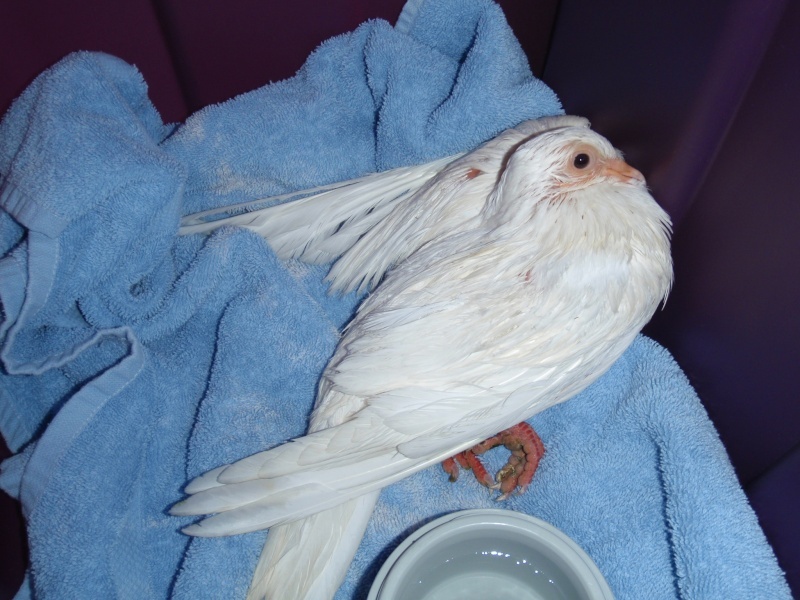 I'm afraid the white pigeon in this thread is in Florida of the US. 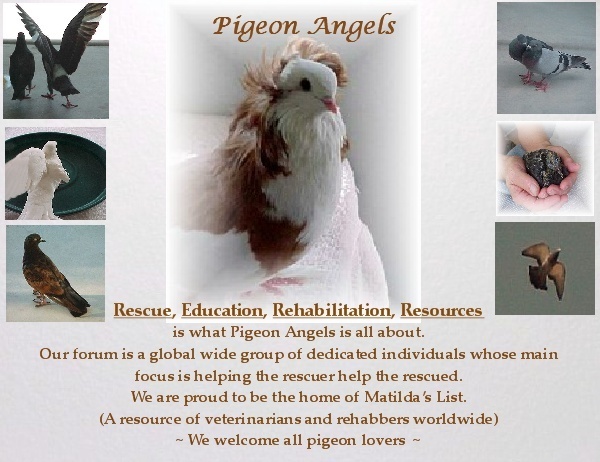 I do know of pigeons in need of home in the UK, though and I will email you a contact. Just wondering how this white pij is doing? Has anyone heard ? No...I haven't heard a thing. I hope she is ok. No...I haven't heard a thing.